(Makes 5 gallons) A rich Amber Ale. 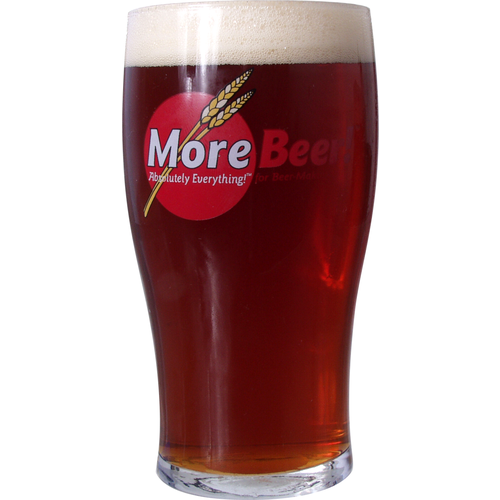 An American variation of an English Pale Ale. 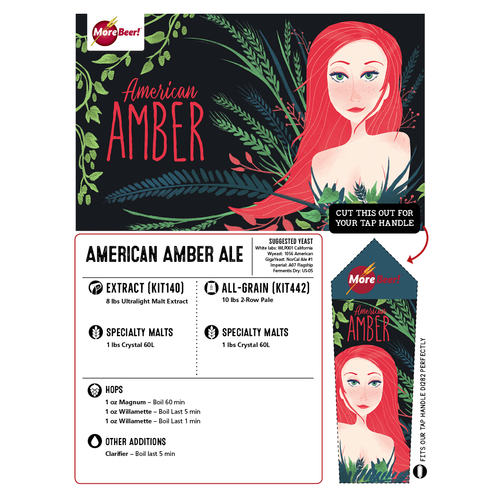 Features Willamette hops for flavor and aroma. The combination of the darker Crystal malts with Willamette hops provides for a flavor that is distinctly different than our American Pale Ale. Higher in alcohol with a creamy mouth feel. A simple great tasting kit. For my 2nd kit I chose one that had a lot of likes. If other brewers are happy with it will be good enough for me! Good reviews, New to More Beer and I wanted a good amber. 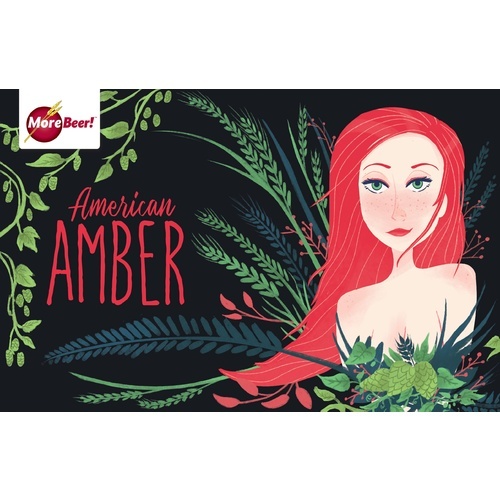 I like amber ales, why not try it? Used the WLP001 California Ale yeast and fermented for only 10 days before kegging. As days pass in the keg the beer flavors are maturing and tasting great. This is the second time I've brewed this beer and I find that I really enjoy it because it is so easy to drink multiple glasses at a time. Came out at 6.2 ABV - I think I added a spare 4oz corn sugar priming packet at the last 10 minutes of the boil, so that could be why this is higher than expected. Nice amber color and good head. I did use Fermcap-S right before pitching yeast to avoid blow-off. They say this actually increases head retention in the final product. The beer would probably be clearer if I gave it more time to settle in fermentation and cold crashed for longer than 24 hours. But I find this recipe to be pretty forgiving to the impatient brewer. I recommend this beer to anyone who likes the hops of American ales and who like the malty characteristics of English beers. It combines the best of both worlds. Cheers! Always a crowd pleaser! Very flavorful beer. Perfect every time. Four weeks after pitching the yeasties, I’m drinking a 22 oz and am encouraged to write about it. It’s a great beverage! It’s a mellow, light-bodied ale up front with a later kick of hop oil that lingers nicely with the alcohol flavor. It’s about 6%. After two weeks conditioning in the bottle, sweetness and immaturity are replaced by more carbonation and complexity. So is life! It’s already really clear, and a beautiful amber color just like the picture. I followed the recipe without modification and achieved 5 gallons of wort with an original gravity of 1.056. One pack of Wyeast 1056 American Ale was pitched @ about 74.8 degrees F. I didn’t use a starter which was, according to the package, manufactured about 1 month prior. 1) Fermentation temperature in the range of 67-69 degrees was maintained for about 8 days until a gravity of about 1.012 appeared, which correlated with expectations. 2) I moved the fermentation bucket into a closet and allowed it to rest another six days @ 61 degrees constant. It reached a gravity of 1.010. 3) It was then racked to a secondary and stored for five more days @ 61 degrees constant. 4) I bottled the brew. It has now been conditioning in bottles for about two weeks in the low 60s Fahrenheit. I’ll give this 1 or 2 more weeks before it’s ready to share! It will only get better. The beer turned out great. I made this one for my wife. She’s not a hops lover. It was not very interesting at first, but after a couple weeks in the keg it was excellent. Whole family loved it. Tasty, about 6.2% and popular with my friends. Good VFM. I brewed this as my 2nd batch and got great results. I used Wyeast 1056 American, but I might've pitched it a bit warm at 75F. It still turned out great and got compliments from all who tried it. I added 8oz of Carapils to the steep just for body/head/fun, but I'm not sure that it did all that much. It had good head and good flavor. I brewed it in February, but I'd like to give it another go during the warmer months when such a stye can be better appreciated. Of the 3 batches I've brewed, this was my least favorite--but that's only because the other 2 batches (stouts) are more my style, especially in the Winter. so this was my first brew. it turned out great. im at about 6 % and it is nice. I am noticing that when i chill the beer it looses the head retention and the carbonation. am i doing something wrong? its a good thing i like room temp beer. This was my second ever brew and it was great. 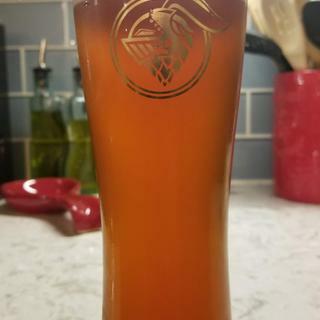 I really worked through a few technical mistakes from my first brew (blonde ale) and got a very crisp and clean amber ale. I was so happy with it that I gave away too much. (I learned to be more greedy since then...) Definitely will brew again! In my record book there's a statement regarding this beer: "This brew is awesome". Hard to get the original here on the Central California Coast so this is a great alternative. Should come with a warning label to keep it away from the masses (and hoard it for yourself). We have brewed this kit from extract 3 times so far. Great color, body, taste and perfect head. Bottled the first 2 batches and kegged the 3rd, which was really a treat. This is a go-to kit for me. The easy to follow instructions also make it a great pick for beginner homebrewers. Beautiful copper color, and a pretty decent amber ale overall. That being said, this beer has a BIG, BIG, Willamette flavor and finish. Maybe a little too much for my tastes. For fans of Willamette, this would be a dream brew. I may re-try this kit, and substitute northern brewer for flavor hops, and mt hood for aroma hops. Note: This brew really improves if you refrigerate (lager) the bottles for several weeks, after they condition for about 10 days. The big Willamette flavor mellows out, somewhat. After lagering this beer for several weeks, the strong Willamette hop flavor really faded, and the overall taste balanced out very nicely. I was five this a four star. I took some of this to my friends recent cook out. He said it was one of the best beers he has ever tasted. I have to agree this has a fantastic flavor and balance. It reminds me of the beer my dad used to give me a sip of 45 years ago in our local pub garden in in England. Try this, I guarantee you will not be disappointed. This is perfect any time of year. Great balance of hops and malt. I will try this all-grain next time. This was the first beer I brewed and the results were better than I expected. It even impressed some friends visiting from Bavaria. I have now brewed this extract kit 2 times and both batches turned out great. I think I've found a new favorite, this kit is awesome. This is by far the best tasting beer I've brewed to date. Both batches came out extremely clear, with 6.8 and 7.1 % ABV. Both batches of this beer carbonated, cleared, and matured faster than any other beer I've brewed to date. I only wished I had waited longer before tapping them, because they got better every day after the first week. This was the first beer I ever made, and everybody who drank it loved it. The instructions were very easy to understand, and the final product was superb! As always this turned out to be a great beer from Morebeer. There kit beers always come out just right. Cheers to that. The one thing i did mess up on with this beer. I always to a late addition to my boils. In this Ambers case it came out a little too light. That was my fault. I will brew this again just wish it was a tad darker. This kit was my foray into home-brewing. A bit advanced for starters, but very manageable. I used WLP550 Belgium Ale yeast in an attempt to recreate "Fat Tire". What I actually got was a cross between "Fat Tire" and "Shocktop". There was a citrus element from the yeast that was unexpected. Fermentation was carried out at 67 degrees. As for alcohol by volume: Way more than expected. My calculations indicated 7.39%. After drinking a 22oz bottle.... I believe that was an accurate calculation. I had the same issue with higher-than-expected ABV. Mine came out to about 6.8% with OG 1.072. No complaints, though! I agree, I made two batches and one was 6.8% and the other was 7.1%. I'm kegging so I did use my bottling sugar in the wort. Great tasting stuff! very malty, caramely flavor. I have no idea how much alcohol content, although, compared to some 6% malt liquor I drank before that, I believe it was far stronger. I previously broke my hydrometer, so unable to test.